In ancient days, our forefathers, the Rishis of Aryavartha, went to the forest to do Tapasya during the four months following Vyasa Purnima—a particular and important day in the Hindu calendar. 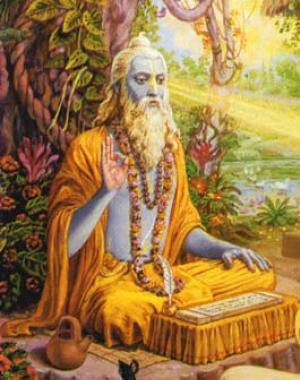 On this memorable day, Vyasa, an incarnation of the Lord Himself, began to write his Brahma Sutras. Our ancient Rishis did this Tapasya in caves and forests. But times have changed and such facilities are not common nowadays although Grihasthas and Rajas are not wanting who are able and willing to place at the disposal of the members of the fourth Ashrama such help and facilities as they can afford. The forests and caves have given place to the rooms of Sadhus in their own Gurudwaras and Mutts. One has of necessity to suit himself to time and place; and change of place and situation should not be allowed to make such a difference in our mental attitudes. Chaturmas begins from the Vyasa Purnima Day when, according to our Shastras, we are expected to worship Vyasa and the Brahmavidya Gurus and begin the study of the Brahma Sutras and other ancient books on ‘wisdom’.